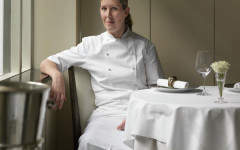 There have only been one or two serious restaurant launches this year – one being the Chiltern Firehouse and the other Fera at Claridge’s. 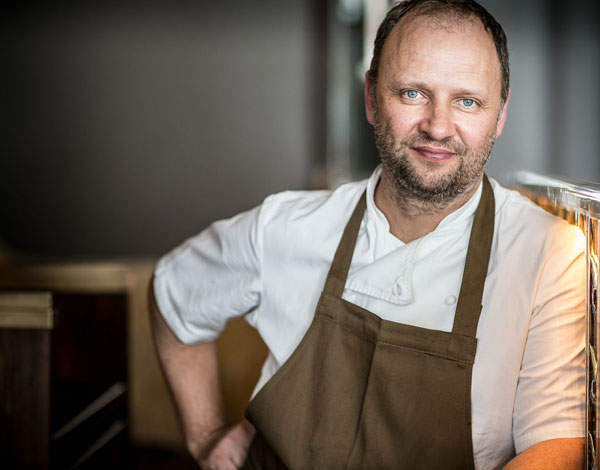 After months of speculation as to who would take over the space from Gordon Ramsey, Simon Rogan (pictured below) was announced as the executive chef. 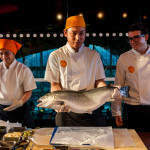 The restaurant itself is run by Ben Hofer, formerly of Viajante, and the kitchen by head chef Dan Cox. The room is, as you would expect from Claridge’s, beautiful from top to bottom – glamorous, sophisticated and yet understated in grey, green and blue tones with storm lanterns providing soft lighting around a central ‘tree’. 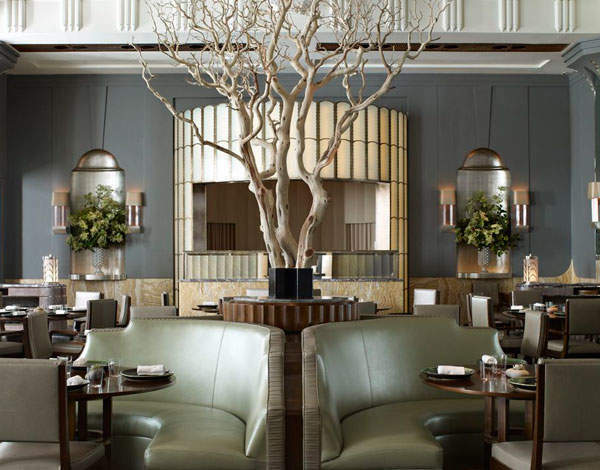 This is hotel dining at its very best – the sort of dining room you just want to indulge in. You would go for the room alone, but when you consider the calibre of food on offer here the room seems a rather insignificant detail. 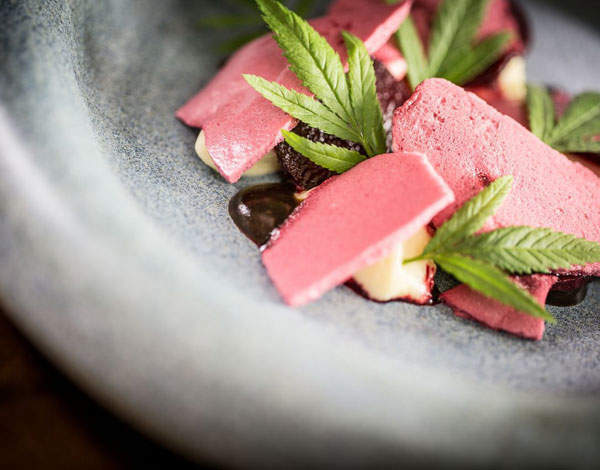 Rogan holds two Michelin stars at L’Enclume in the Lake District and I’m sure it won’t be long before Fera gathers its own accolades. You can choose between à la carte and the tasting menu (either six or ten courses) though considering there is only a ten pound difference between the three-course à la carte and the six-course tasting menu, I would certainly plump for the tasting menu. As is mandatory now in most top restaurants your meal begins with a selection of ‘snacks’ – here, you will have rabbit with lovage, Winslade cheese whipped into a glorious haze with potato and topped with duck heart, and depending on your course number selection between one and four more. 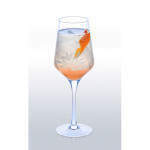 These come out swiftly, brought to you by the thoroughly professional and warm waiting staff. Snacks are followed by the bread course as apparently it is no longer the done thing to serve bread before the meal. If I had it my way it would be served throughout. The malt bread comes with whipped butter and a deep, rich, onion broth. A broth so good it caused Michael Roux Junior to give out a little ‘wow’. I know this because he was there on the same night that I was. It is incredible how a simple broth can have so much flavour and depth. This, if nothing else, shows the skill of the chef, bringing something that to most people seems very simple to incredible heights. Every single dish that was put in front of us was exquisite. Of special note was one of Rogan’s signature dishes – his grilled salad. Cooked over embers, the salad – something I on principle never order when I’m out – is transformed into something quite different. There is no limp lettuce here but rather crispy, smoked leaves, sitting next to softer flowers all on top of the most heavenly truffle custard and Isle of Mull cheese. The waitress joked that we didn’t want to know how many calories were in it. I, however, did want to know so she went to the kitchen and came back. One hundred and eighty-seven calories. I’d order every single one ten times over and, if I’m honest, I was expecting the count to be much higher. I was secretly hoping for it to hit the thousand mark. The puddings, in my opinion and as someone who doesn’t like puddings you are most welcome to take this with a pinch of salt, were on the whole less successful. This isn’t to say they weren’t very good, just less harmonious as complete dishes than the mains. Really, though, this is a very minor gripe after what was a truly fantastic meal. Fera really delivers on all fronts – from the room and staff to the innovative and quite frankly simply delicious cooking. There is also the additional benefit that you will not have to fight with Lindsay Lohan for a table. Right now there is no more enticing high-end fine dining option in London. Fera is worth every penny.